1. Damage to a new vehicle: This is mostly cosmetic damage, and includes minor pin-striping and scrapes to bumpers. On occasion an air dam gets torn off or a license plate is bent out of shape. The skid plate will protect the undercarriage if you bottom out. I recommend you add rock sliders on the sides of the vehicle as one of your first upgrades in armor even if you only plan to do forest service roads. The first little dents “hurt” you more than the vehicle. On the bright side, you can now justify an aftermarket bumper. It is a toss as to which of these next two is the bigger concern. I picked rolling over as the number 2 concern. 2. Rolling over: Normally another rare issue. What makes good YouTube fodder is the extreme stuff with above average risk. 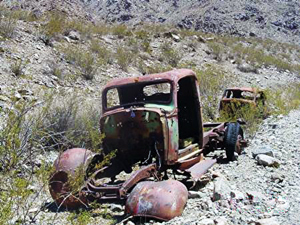 When it does occur, the driver is often in an extreme situation or driving recklessly. Take your time going through rough terrain and around obstacles. And avoid high risk situations. Perhaps not a comfort to you, if you do make a mistake and “roll over” - most times, the vehicle will only tip over onto a side (what we call a flop). These tend to occur while driving slowly, so damage to the vehicle is limited. 3. Stuck forever: Rarely happens. Sure you are going to get stuck sometimes. Your buddies will help you out of a jam. Most stuck situations are what we call shallowly stuck - lightly hung up on a rock or mud just up to the side walls. A quick pull a few feet by another vehicle and you are out. If you go by yourself, a winch will get you out of most situations. Of course you will avoid situations that are right on the edge of being doable. But remember to always go out with at least one other vehicle. 4. Breakdowns: They occur, but the more common issues are resolved with proper training and tools. Remember, too, that you’re likely to be with other drivers. Read some of our other articles to prepare for and deal with breakdowns. Tires are the number one problem in my opinion. Focus on learning the skills to fix tires (they are not hard) and acquire the necessary tools. Bottom line: a breakdown need not end your four wheeling trip. 6. Breaking a bead: Also called losing a bead, this is common. This concern is warranted but easily mitigated. Four wheelers air down nearly every time they go off road. 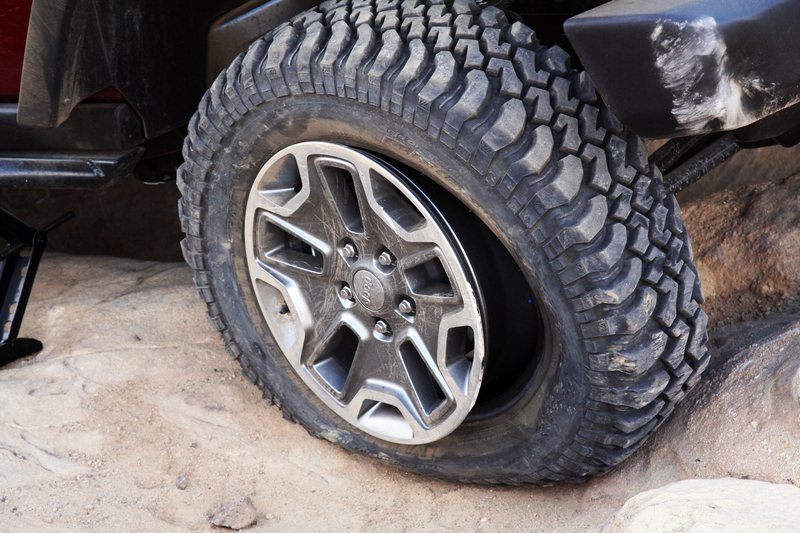 If you turn too sharp, too fast in soft stuff or against a rock, the deflated tire is likely to lose its bead. The issue sounds worse than it is, though. 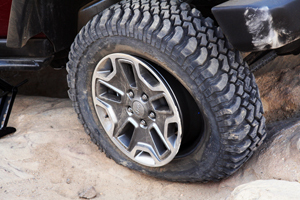 As you’ll learn in this article, Tire Problems Shouldn’t Deflate Your Day, the problem is easily corrected with an air compressor and jack. To build your confidence, take some introductory classes. Everyone in the class is in the same position as you, and you’ll learn together. (I offer a number of beginners’ classes.) Bear in mind that making mistakes is a part of your training. Don’t get worked up if, for example, you pick the wrong line. You’ll quickly recover, and you’ll be a smarter four wheeler as a result. 8. Lack of skill & knowledge: with all the YouTube videos available of extreme situations there is a sense that they’d be in over their heads. There is no need to jump into high risk and difficult trails. One trail book I have for Southern California list over 150 trails (representing about 1500 miles). Only 19 of them are rate above a difficulty Level of 4 (out of 10). 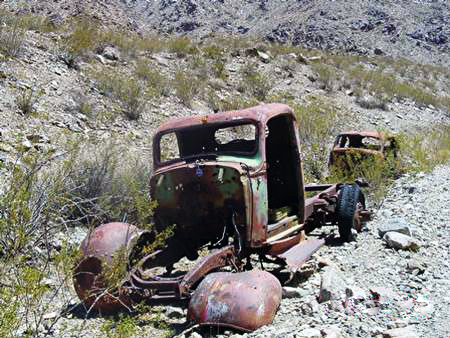 Most of the trails take you to scenic overlooks, old ghost towns, old mines, and great camp sites. However, you need good clearance and 4-wheel drive to get there. An off-road training clinic will quickly eliminate much of the concern. There are so many trails, and such a wide variety of terrain, that you’ll easily find a path that is enjoyable and surmountable. A couple tools can help you determine your angle. One is an angle finder carpenter's use, available in any hardware store. Another one, you can find at 4WD stores can be glued to the dash, it shows pitch and yaw. 10. Lack of immediate emergency services: Some 4WD areas as so remote, you’re outside the 2-hour window that normally defines urgent care response. Worse, you may be outside of cell range, as well. Some steps include: Get basic first aid training. Learn how to stabilize an injured person. Take a basic survival course, too. You may need to camp out one or more nights while waiting for help. Pack alternate forms of communication. These can include ham radio (requires a license), a satellite phone and a personal locator beacon or SPOT device. Always ride with at least one other vehicle. I can’t stress that enough. Especially while still inexperienced, don’t consider going alone to anything but the easiest trails. I hope you have a better understanding of how to address four wheeling issues. The trails await you. Get the training you need, pack your vehicle, and then get out and enjoy the ride.